Chytridiomycetes are true Fungi that require water to disperse throughout their environment. Unlike ascomycetes, basidiomycetes, or zygomycetes, chytrids, as they are commonly called, produce flagellated, asexual reproductive cells known as zoospores. Chytrid zoospores are readily dispersed in the presence of free water but this need for water does not restrict them solely to aquatic habitats. Besides being commonly found in lakes, streams, ponds, roadside ditches and coastal marine environments, chytrids also are present in soil. As members of terrestrial and aquatic microbial communities, chytrids play an important ecological role in the degradation of recalcitrant materials like keratin, chitin, and cellulose. Chytrids live saprobically or as parasites in, or on, a number of different organisms and substrates such as pollen grains, insect exoskeletons, protists and small invertebrates, amphibian skin, other fungi, pieces of plants, fruits, and waterlogged twigs. When looking for chytrids, the first step is to collect. Plastic bags, screw top containers (empty jars and plastic food containers), specimen cups, etc. are all good for collecting water and soil samples. Plankton nets can be used to collect planktonic substrates from aquatic habitats. A water body of any size (especially if algae are present) or soil will probably yield chytrids. Going to the field also provides an opportunity to collect substrates for direct examination, e.g., aquatic insect exoskeletons (mayfly and dipteran exuviae are particularly good), algae, protists, plant material, fruits, twigs, pollen, etc. If you are looking for a specific chytrid, first learn its preferred substrate and habitat (from Sparrow 1960 or if the species was described after 1960 from the bibliography here), then look in a suitable location for that material. Keep a log of your collections by writing down location, habitat description, date, and type of collection (soil or water and whether or not the soil was wet or dry). Give each collection an identification number. Habitat and place information is useful in determining what sites are good places to collect, and for reference when you wish to re-isolate a particularly interesting chytrid. Collections should not be allowed to get too warm, so you may want to bring along a cooler with ice to keep the samples, mainly water samples, from overheating. The use of rubber boots or wading boots is also a good idea as these allow you to walk along the edges of lakes, ponds, streams or in bogs without having to worry about getting wet or bitten by one of the local inhabitants. Hats, sunscreen and bug repellant are must-haves, especially when collecting in certain areas in the warmer times of the year. When filling containers, it is a good idea to not fill them to the top but to leave them 1/2 to 2/3 full. Once you’ve obtained some material, its time to go back to the lab and look for chytrids under the microscope! 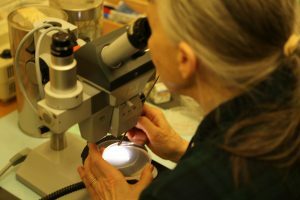 A compound microscope is necessary for observing chytrids on baits. Once you are back in the lab, transfer your water collections to clear glass Petri dishes, crystalizing dishes, or larger dishes called finger bowls. Watch glasses make good covers for the larger finger bowls and help prevent evaporation. Record the collection number and date on each container with a marker pen. Soil samples and dry substrates should be kept dry and in their original containers until ready for baiting. Examine biota in water samples under the microscope for signs of chytrids. You can keep cultures going by adding Alga-Gro® (Carolina Biological Supply) (to keep the algae happy) or distilled water to prevent them from drying out. It is also a good idea to keep algal cultures under illumination or near a window. If you find a chytrid you want to study, a variety of techniques are available for isolating it into pure culture (unfortunately this is not always possible, especially with parasites!). aquatic habitats to determine what chytrids are seasonally active. Place several pieces of bait and two or three marbles into each bag and place bags into a lake, pond, stream, bog, or ditch for a week or more before being re-collecting them. 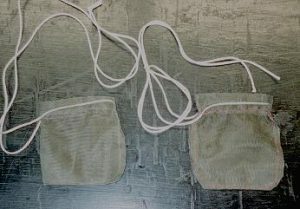 The length of time the bait bags remain depends on the time of year; a good rule of thumb is a week when water temperature is above 20°C and longer at lower temperatures. Collect bait bags along with some ambient water and take to the lab and examine baits microscopically for chytrids. 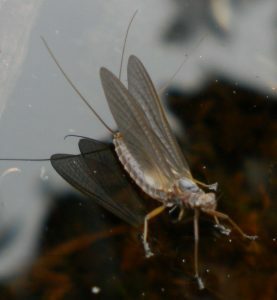 This method is most productive during cooler parts of the year; oomycetes often over-run baits when the water is warm. When collecting, record the temperature of the water. 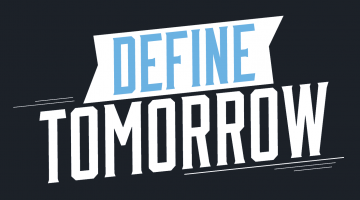 This is important later when culturing because some cultures may grow better at the temperature of the environment from which they were isolated versus room temperature. Lastly, when examining baits from bait bags or gross cultures in the lab, allow a couple of weeks before discarding them because some chytrids take longer to appear than others. This is especially true with members of the Cladochytriales, which can take up to three weeks to appear on onion skin and corn straw baits. If you see mature sporangia of something you want, isolate it as soon as possible, before it becomes overgrown by undesirable organisms. Two main ways of isolating involve harvesting zoospores from pieces of bait placed in depression slides and scraping sporangia from bait onto agar media. With the depression slide method, cut out the part of the bait with the greatest number of mature sporangia and place it in the depression with a drop or two of distilled water. Place the depression slide in a damp chamber made of a triangle of bent glass tubing in a deep Petri dish. Place a couple mL of water on the bottom of the dish; the well slide is placed on the glass triangle to elevate it above the surrounding water, which slows the evaporation of the water in the well slide. 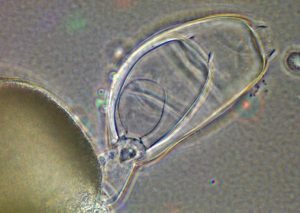 Watch (by periodically observing the water in the well slide with the 10X objective on the stage of a compound microscope) and wait for zoospores to be released. Once numerous swimming zoospores are seen, transfer the zoospore suspension with a clean Pastuer pipette onto an agar plate. Make a mark with the tip of the pipette on the agar surface where the drop of water will be placed for later reference when checking inverted plates with the compound microscope. Then pipette all of the liquid onto the agar and tip the plate so the water can spread. Allow the free water on the surface of the agar to dry before wrapping the plate junction with laboratory film (e.g., Parafilm™). The other method of isolation involves scraping sporangia from the bait onto agar medium. While looking through the dissecting microscope (usually with the 4X objective = 40X magnification), move sporangia onto the surface of an agar plate from the piece of bait with a sharpened needle (#26 Chromel wire, inserted into a holder and sharpened on a whetstone). The sporangia are then picked up with a flamed and coooled needle and dragged through the agar to clean them of bacteria, yeast, etc. When cleaning by dragging through agar, it is easier to move the plate than the needle. One can also repeatedly pick up and put down the sporangium on fresh agar as a way to remove bacteria. Once sporangia are cleaned, place them individually onto a new agar plate, and seal with Parafilm. Crcle the location of each sporangium on the bottom of the plate to make them easier to find when inverting the plate on the stage of a compound microscope to check for zoospore release and growth. 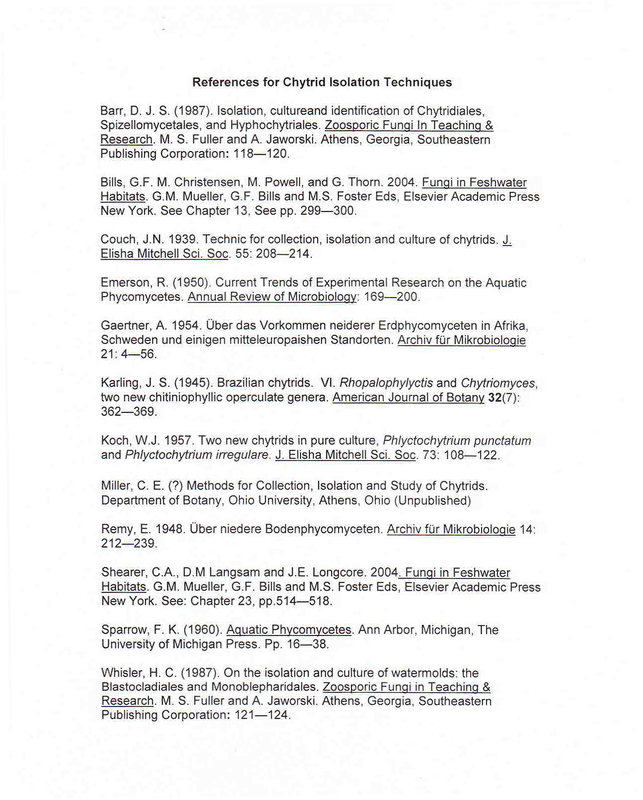 Common media for chytrid isolation include PmTG, mPmTG, corn meal agar, and 1/4 strength YPSs Other types of media are listed in Zoosporic Fungi for Teaching and Research Jaworksi and Fuller. Barr in ZFTR also suggests the use of antibiotics in the isolation media to cut down on bacterial contamination (200 mg/L Penicillin and 200—500 mg/L Streptomycisn sulfate). Isolation plates should be examined daily for growth of chytrids. Because chytrids usually grow slower than the competition (other fungi, Oomycetes, bacteria, etc..), contaminants should be removed by cutting them out aseptically to prevent further contamination. Removing contaminants (weeding) allows the chytrid time to develop before it is moved to a clean plate. After a bacteria-free colony has grown, transfer it to two nutrient agar slants for duplicate stock cultures. We prefer screw top culture tubes (125 mL X 20 mL).Chytrid cultures can be maintained long term by transferring growth to new nutrient agar slants every three months if cultures are kept at 4°C. But as with isolating chytrids some cultures require different ways of keeping them going, so do not be afraid to experiment to see if something else will work. You never know until you try! For longer term storage, chytrids can be cryopreserved and kept at −80 C or in liquid nitrogen. See directions in: Boyle, D. G.et al. (2003). Cryo-archiving of Batrachochytrium dendrobatidis and other chytridiomycetes. Diseases Of Aquatic Organisms, 56: 59–64 and Gleason et al. (2007). Preservation of Chytridiomycota in culture collections. 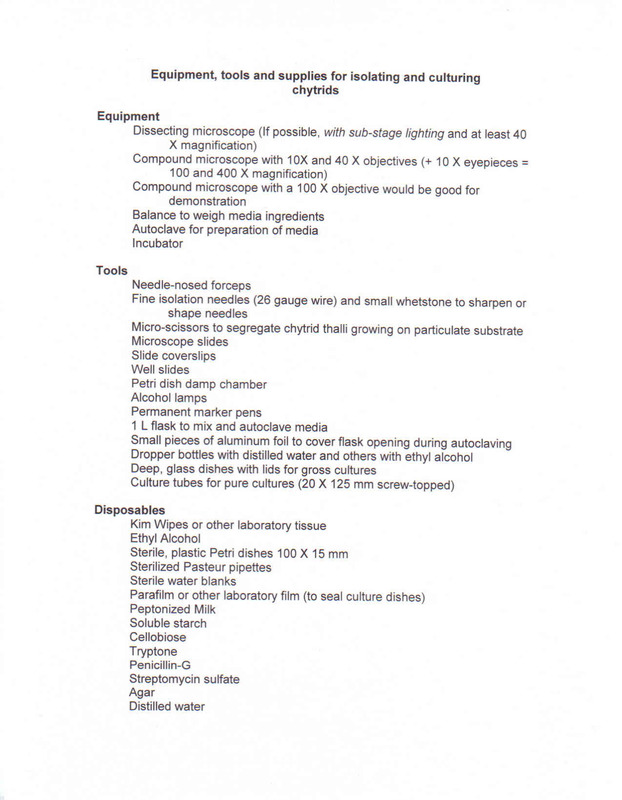 Mycological Research 111: 129–136. Isolation and culture media– Common isolation agar recipes can be found here. Historical Original Sources– Go to the literature for more details.